The clocks sprung forward yesterday but the weather? I don’t think the weather knows it is officially Spring in the UK. It’s 9 degrees, overcast and drizzly (I’ve lived in the UK for 10 years, it is true, I’m now obsessed with the weather) not exactly turn off the heat time. Cut up or crush garlic and heat for a few mins in the coconut oil or oil of your choice. Add chopped carrots, water and vegetable stock, bring to the boil, then let simmer for 25 mins or until the carrots are soft. 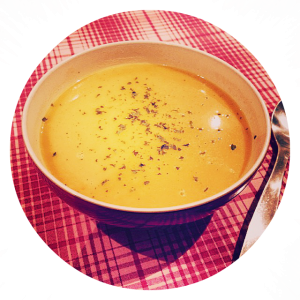 Once carrots are soft take the soup off the heat, add the ginger and then blend with hand mixer (if using hand-mixer wear some protection! it can be quite splashy) or transfer the soup to your blender in batches, 1 cup at a time -blend, then add in another cup- blend until fully mixed – lastly, add 1/2 can coconut milk and blend again. Transfer back to the pot if you used your blender and add all the seasoning you like to taste. *Recipe? Yeah, not the normal thing I talk about on here but it is just so dam tasty and easy, it is too good not to share.